Just a quick reminder that Thursday, April 2nd is our next WiN meeting. Our guest speaker is Nancy Este, RHN. 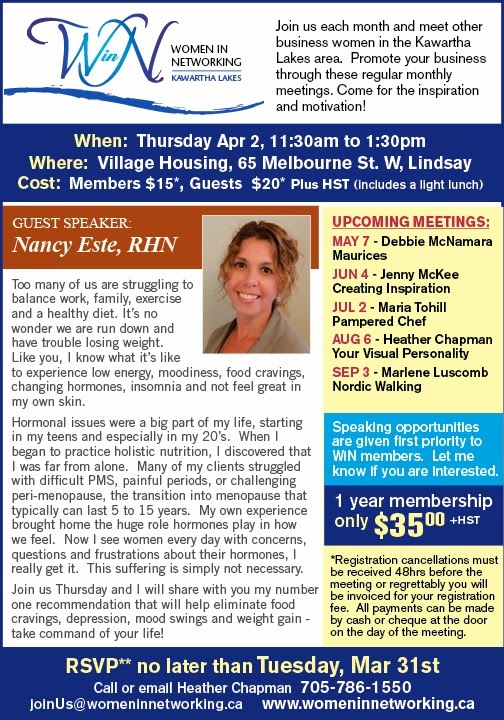 As a Registered Nutritionist she will share with you her number one recommendation that will help eliminate food cravings, depression, mood swings and weight gain and take command of your life! Please let me know as soon as possible if you are planning to attend and do share with friends and colleagues if you think they may be interested in coming out. I look forward to seeing everyone on Thursday!